If you sort the wRC+ leaderboard, you find Mike Trout sandwiched in between Eugenio Suarez and Steven Souza Jr. That’s the bad way to spin it. The good way to spin it is that Trout is in sixth with a wRC+ of 210, and that would also easily be the best mark of his career. I don’t have any good reason to write this right now, except that it’s Mike Trout, so, hey, why not? Does Trout have anything going on underneath the surface? There’s more in here. 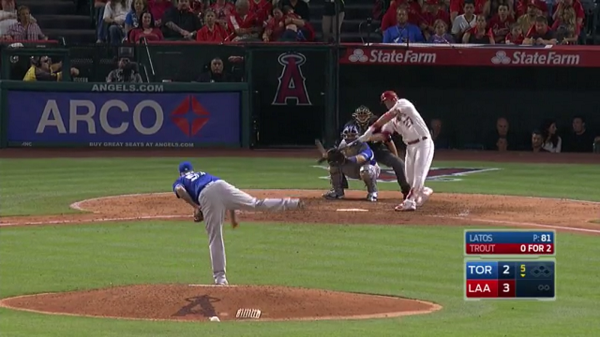 One thing you might notice is that that’s a first-pitch home run. Trout has gradually been getting more aggressive. He used to swing at the first pitch about 10% of the time. Last year, he jumped to 17%, and so far this year, he’s at 26%. Just in terms of overall swing rate, Trout right now is at 45%, which would be a career high, easily. He has his highest-ever swing rate at would-be strikes, and his chase rate is the highest it’s been since he first came up in 2011. Trout isn’t an aggressive hitter, but he’s looking like a more aggressive hitter, by Mike Trout standards. Something to watch over the coming weeks and months. Continuing on, that pitch there also would’ve been a ball. Trout swung, and hit it, and hit it hard. This is presumably just a weird statistical fluke, but Trout’s in-zone contact rate is just under 83%, and his out-of-zone contact rate is just over 81%. The two rates are separated by about one percentage point. His career separation is 18 percentage points. Trout’s been hitting a lot of would-be balls. That doesn’t seem good, but, again, 210 wRC+. Nothing to complain about here. Just an observation. And, at last, that first-pitch homer went to right-center field. Trout’s been less about pulling the ball in 2017. I calculated the difference between pull rate and opposite-field rate. Last season, among qualified hitters, Trout ranked in the 44th percentile. This season, he ranks in the 14th percentile. It’s quite exaggerated when you look at Trout’s ground balls, alone — in terms of pulling grounders, last year, Trout ranked in the 91st percentile. So far this year, he ranks in the 7th percentile. The 7th! Pulled ground balls are basically death. Trout hasn’t been pulling so many of them, and he’s still ultra-dangerous when the ball is batted back. His approach for the first few weeks has focused on using the whole field, and although everything is always cyclical, this is at the very least a helpful reminder that Mike Trout can be successful in countless different ways. 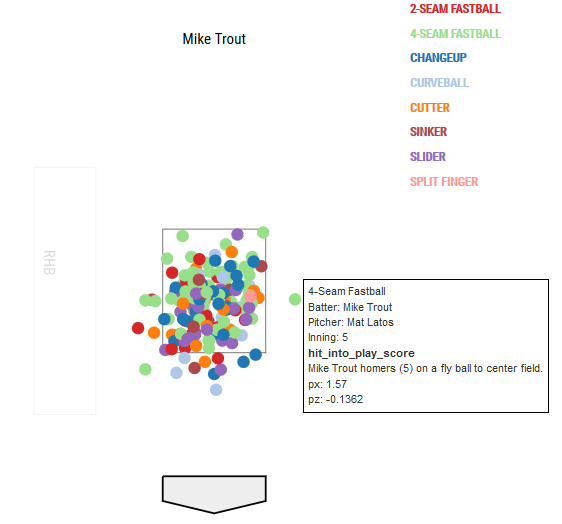 So, early Trout: more aggressive, with more contact out of the zone, and more balls hit the other way. His numbers are fantastic. That last part — that’s the part that doesn’t change. We hoped you liked reading Periodic Mike Trout Update by Jeff Sullivan! Is Baseball’s Most Improved Hitter…Taylor Motter? I don’t know what to make of the fact that Ryan Zimmerman is sitting two spots higher on the WRC+ leaderboard with a 224. As Dan Zymborski would say: It’s April. I think I heard someone last year make the statement that you can tell when hitting stats are starting to normalize across MLB when Trout assumes his role at the top of the hitting stats (WAR,wRC+, etc.). I agree with this. With the caveat that in 2015, Bryce Harper had a hot streak that lasted the whole season and the hitting stats never completely normalized.